St. Clement's Cathedral (Katedrála sv. Klimenta) is one of two churches that form the Klementinum, the largest and most historic complex of buildings in the Old Town in Prague. The cathedral is located on Karlova street, the 'Royal Way', which leads from Charles Bridge to the Old Town Square. St. Clement's is a magnificent Baroque structure built in 1711–1715 by A. Lurago to the plans of architect F.M. Kaňka. It was erected on the site of a Gothic church demolished in the 15th century. St. Clement's has a single aisle with a divided ceiling. Its richly decorated interior includes Stucco decorations by S. Gőtzler, paintings by I. Raab and a picture of St. Linhart by P.J. Brandl. The murals of St. Clement's life in the dome are by J. Hiebl, while his statue is by F.I. Weiss. Other statues are by M.B. Braun. The side altars, the pulpit, the confessional and the organ loft all deserve attention too, as well as the main altar which was painted by J. Kramolín. St. Clement's Cathedral represents one of the most important examples of Baroque architecture in Prague. Today it is owned by the Greek Orthodox Church. During the winter the interior of the cathedral is heated and the seats have cushions, but it is advisable to wear warm clothing for the concerts. Our long standing relationship with St. Clement's ensures that by booking tickets for concerts through Prague Experience, you are guaranteed the best seats available, generally in rows 1-2. 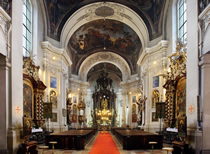 For listings and to book tickets for classical concerts at St. Clement's Cathedral: Prague concerts.